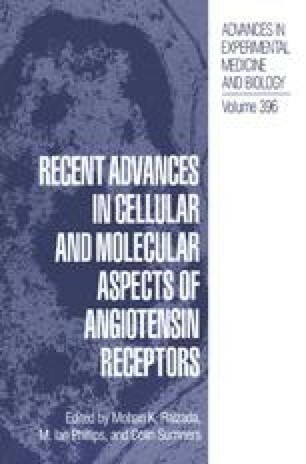 Angiotensin II (AngII) is the peptide effector hormone of the blood renin-angiotensin system (RAS). Central to the role of the RAS as a hormonal regulator of cardiovascular function are the actions of AngII on vascular tone and on fluid and electrolyte homeostasis (1). It is commonly accepted that the functions of the blood RAS are supported by local angiotensin-generating systems in various tissues, including the heart, kidney, adrenal, blood vessels and brain (2–4). Hence, production of Angll in particular brain areas can lead to hypertensive changes in the periphery. (3,5,6).